Every garden should incorporate ground covering plants! They form a living mulch (thus suppressing weeds!). Can create a living wall cascading over large retaining walls. Are a must have for any garden rockeries. 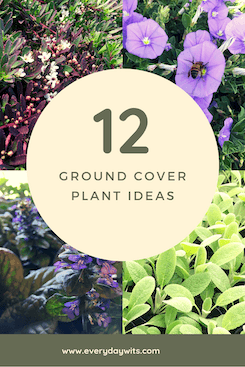 Here are some specific, awesome ground cover plants for amazing flowers, full sun drought tolerant varieties and ones for under trees or shaded areas. Ground covers for amazing flowers. 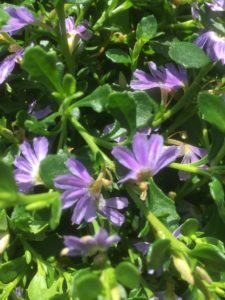 Scaevola– Scaevola albida ‘Mauve clusters’ is an incredible ground cover! It will flower throughout most of the year. 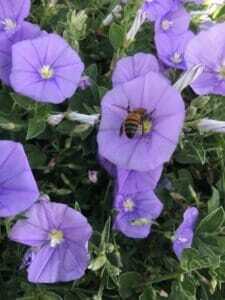 Producing small mauve flowers that bees adore! Mauve clusters is an Australian native and could easily be placed into the drought tolerant category. It’s super hardy! It will spread to around 1.5m (5ft). Looks great in a rock garden. We have ours planted near our wildlife pond. It softens the rocky edges beautifully. 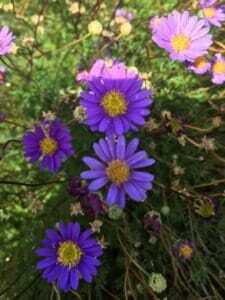 Seaside daisy– Botanically known as erigeron karvinskianus. This is an old fashioned plant that’s a proven performer! It flowers in mass during the warmer months and even here during winter we get flowers! 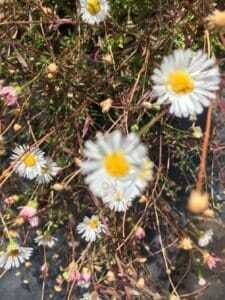 The flowers are small daisy like. They change colour as they age so there is always a variation of pinks and whites. Erigeron will spread to about 1m (3.5ft). Excellent for cottage gardens and as an edging plant near garden paths. Convolvulus sabatius– Blue convolvulus. A really easy to grow ground cover. The blue flowers are produced in mass throughout spring, summer and autumn are truly spectacular! Sometimes it is sold as convolvulus mauritanicus, this is just a synonym- both are the same plant. Blue convolvulus will spread 1-2m (3-6ft). This one looks it’s best cascading over retaining walls. Brachyscome– Commonly referred to as native daisy or cut-leaf daisy this is another Australian native. The foliage is soft and fern like, it’s really quite attractive. There are a few flower colour variations available- pinks, blue, mauve and white. Native daisy’s will flower practically all year long! This has the smallest spread of the flowering ground covers I’ve listed. It will only spread to about 50-60cm (2ft) wide. Its a great ground cover in a rock garden. Drought tolerant/Hardy/Full sun ground covers. Myoporum parvifolium– Creeping boobialla. Another hardy Australian native. There are 4 main variations available. This is another ground cover that bees adore! Fine leaf form – Fine lime green foliage with small white flowers. Pink form- Army green foliage with pink flowers. ‘Purpurea’- Dark purple foliage with light purple flowers. Broad leaf form- Basically the same as the fine leaf variety, just a slightly larger leaf. All 4 are incredibly tough and hardy. They will spread to over 2m (7ft) if given the room. Great for covering steep banks or spilling out over walls. Lamb’s Ear– Stachys byzantina is also super tough and hardy. The soft blue-grey foliage is extremely attractive. Flowers spikes up to 15cm (1/2 ft) will appear from late spring into summer. The flowers are light purple in colour. 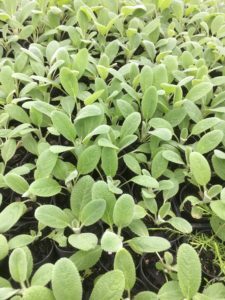 Lambs ear is a great ground cover for use in areas where kids play. They are almost indestructible and the soft foliage and texture are perfect! 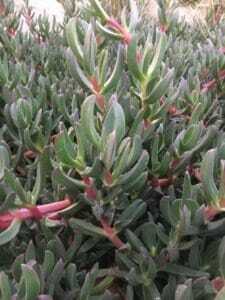 Pigface– A very hardy succulent ground cover. There are numerous variations in foliage and flower colour available, so you are spoilt for choice! Very vibrant flowers are produced in mass from late spring. Large established plants will flower sporadically throughout the year. Pigs face is excellent for hot exposed areas of the garden. Smaller varieties work well in rock gardens. Use larger varieties on slopes or spilling over walls. Sedum– Stone crop. Sedums are used much like pigs face. They are a succulent also. Not all sedums are grounds covers, however many are. There are so many to choose from. My favourite for our area is sedum ‘gold mound’. It has beautiful golden yellow foliage. Stonecrop as the name suggests are perfect for rock gardens in exposed sunny spots! With so many varieties available a rock garden with just sedums can be very attractive. Ground covers for under trees/ Shade. Ajuga– Bugleweed. Perfect for planting under trees. 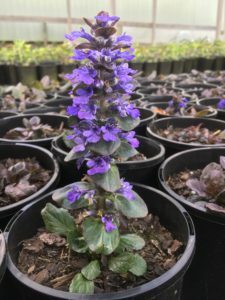 It doesn’t matter if the trees are deciduous as ajuga can grow in sun or shade! Ajugas come in a wide range of foliage colours. Greens, Purples and variegated mixes are readily available. All of them have mauve flower spikes, produced predominately in spring. Ajugas make a perfect living mulch as the leaves are large and they grow so thick. They will easily smoother any weeds trying to establish themselves. 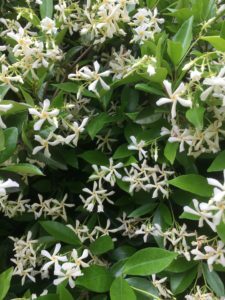 Trachelospermum asiaticum– Japanese star jasmine. Defiantly one of my personal favourites! Very attractive foliage. 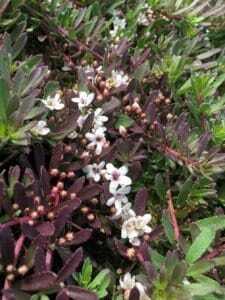 This plant is technically a climber, however here we commonly grow it as a ground cover. The flowers bloom in spring and are incredibly fragrant! Allow each plant a spread of about 1m(3.5ft) when using as a ground cover. 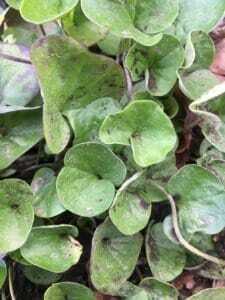 Dichondra- Kidney weed. A very attractive easily grown ground cover, perfect for shaded sites. There are 2 varieties I like dichondra repens which has simple green foliage. The other being dichondra argentea ‘silver falls’ with grey foliage. Both species will grow in very shaded areas. They can actually be used as a substitute for grass in these shaded areas, as they can tolerate some foot traffic. They look their absolute best planted amongst stepping stones! Violas– Violets. Most violets will grow really well in shaded areas of the garden. My favourite for planting under trees is viola labradorica or riverina. More commonly known as an alpine violet or dogwood violet. 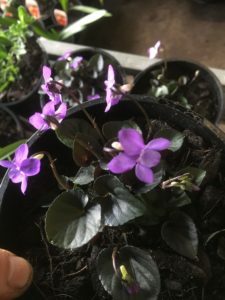 Violets have very attractive flowers which usually appear in mass during spring and then on and off throughout the year. I find their foliage very attractive also. Most violets will spread by runners and self seeding. Allowing them to naturalise under trees creates that desirable living mulch. 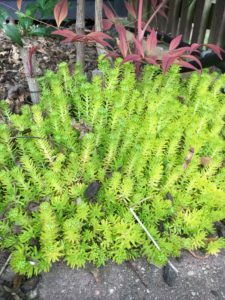 Hopefully this quick read has given you some good ideas of plants you can use as a ground covers in your garden. We hope this has helped you in some way. If so subscribe to our mailing list so we can share more helpful content with you. We hate spam as much as you do and will only send an update once a month, promise! We sometimes recommend products on our website. If you make a purchase from a link on our site we may receive a commission.